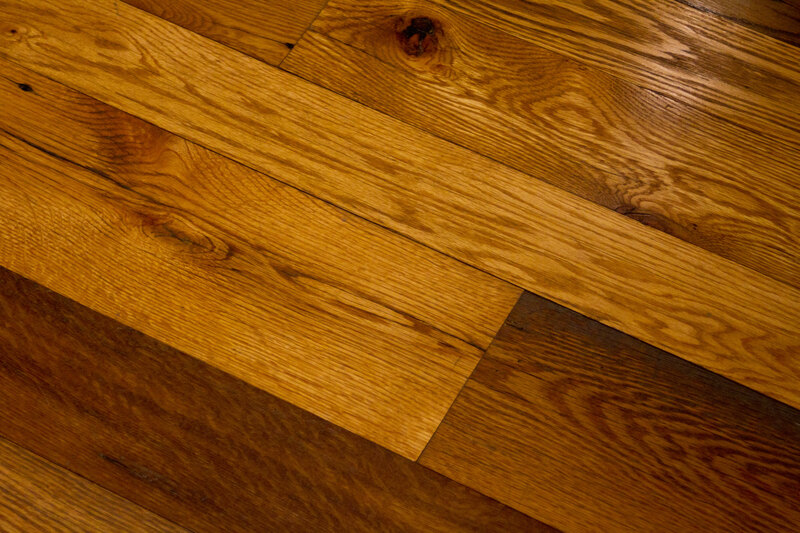 South Face Oak flooring is the classic reclaimed oak floor featuring all that reclaimed oak barn board has to offer. This floor is graded to enhance the natural rich color variation, nail holes and sound checking throughout the grade. South Face Oak is known for its rich coloring and warmth making it the number one selling reclaimed floor at Bingham. All barn board products will have nail holes, color variation, and natural sound checking. The southern exposure of the barn receives the most harsh exposure and those boards have the best characteristics to offer our South Face Oak flooring boards. Greys balance the warm hues of the reclaimed oak floors finished with a tung oil finish. The South Face Oak Flooring is a beautiful complement to this contemporary Boston Home. “The beams we bought previously and the new wall look great together and we are very happy with your products and service. Thanks for making our remodeling project a success.” -Jim C.
The South Face Oak custom flooring features reclaimed oak barn board. Barn board is found throughout a salvaged barn in mainly three areas; siding, loft boards, and interior partitions. Barn board that was exposed to the natural heat and the elements has aged overtime, creating not only unique coloring, but one-of-a-kind textures. The oak barn board is found from the mid-Atlantic states right up through the Ohio River Valley. Bingham values the long-time relationships with other small family run businesses to source and reclaim the finest materials our salvaged barns have to offer. * Please note due to the reclamation process and the natural differences in reclaimed wood, our displays and samples are close representations of a finished product. Each floor is unique and may contain more or less characteristics than represented. Wood is a natural product and because of this we recommend ordering samples of our products before making your flooring choice. We will send multiple pieces of each product to give a full representation of the grade and specie. Together, these pieces represent the grade, specie or product specified. Please do not reference an individual sample, piece of the sample or image as an accurate representation of the entire grade, specie or product. Please consult your sales representative with any questions or to request more samples.